Highways, expressways, and heavy traffic areas are constantly undergoing construction. Many drivers are nervous when navigating through work zones, and with good reason. These areas can be extremely dangerous, and careless drivers who fail to exercise caution when traveling through them put workers and other drivers in serious jeopardy. Trying to avoid hitting the numerous construction vehicles parked on the shoulder of the road, squeezing through narrow lanes of traffic, and putting up with unexpected detours and sudden lane changes frequently frustrate drivers, sometimes prompting them to take chances they later regret. 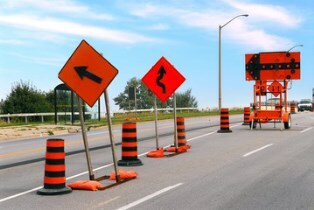 Construction zones are usually marked with orange cones, workers in bright vests, and plenty of warning signs that notify drivers to reduce their speed and increase caution, yet accidents still frequently occur. Narrowing of lanes can result in scraping on the sides of vehicles, and detours often cause drivers to become frustrated or confused, leading to collisions. Construction is unavoidable because roads need to be properly maintained. However, the construction process carries with it the potential to endanger drivers. A misplaced sign, loose debris, pathways blocked by machinery, and poor lighting can all make safe navigation of a construction zone very challenging. Construction sites change from day to day, and this constant state of flux can make it difficult for construction workers to realize the many dangers their work site creates for drivers. Work crews have a legal duty to take precautions in order to help prevent vehicle collisions due to these hazards. If an accident occurs due to inadequate warning signs or unmarked road hazards, the construction company responsible for maintaining the roadway may be held liable for monetary damages in a personal injury or wrongful death lawsuit. Since the government is responsible for roadways and repairs, it also may be held liable for monetary damages. Posting high-visibility signs far enough ahead to warn motorists of potentially hazardous conditions, including slower speed limits, detours, lane closures, uneven pavement, and stopped traffic ahead. If you’ve been injured in a construction zone vehicle accident, you need professional representation by a skilled and experienced attorney who will fight for your rights. A successful recovery may depend on a prompt and thorough investigation. Your lawyer can help determine if the construction zone’s design and markings contributed to your injuries. Contact the Law Office of Kearney, Freeman, Fogarty & Joshi, PLLC, by using the form on this page.